I could not have written this page … because even I had no idea who I was … even to such a small detail as my favorite color. In Debt $96,000 … half of that mine from the divorce … my half of the assets ? $0 …. the phone rang constantly with collection agencies and attorneys demanding payment. I was working 3 jobs … existing on 4 – 5 hours of sleep a night making up only on saturdays and sundays …. With two children in college and both nursing an anger at me for the divorce, I WAS TRAPPED by my debt … by my fate … and by my own self loathing. We were retiring from our respective teaching careers … to pursue our interests in writing, photography and art … masters of our own fate(s) … free to choose each morning what we did for the rest of the day. We thought that our journey was slowly winding down … instead a new and just as stressful one was beginning … as we began casting about to find our ‘lives’ … plans and reality often seemed to be in conflict. A part-time job to slow the slow drain on our savings … but worst was the feeling of being unfulfilled. We returned to Bahrain … a plea from our former school … ” need two English teachers”. It was a prayer answered … Bored with “retirement” and watching our savings dwindle …. only 3 seconds elapsed before we answered yes. Within ten days we are back in the land of camels, dust & Inshallah … Grateful to be able to step back into our expat life & reconnect with a sense of adventure. It was almost as though we had never left … except for all the things we gave away when we left that needed replaced. 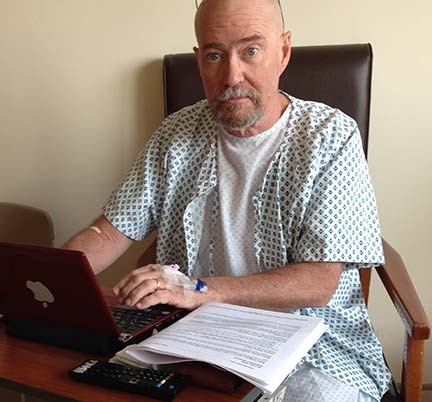 I am in the hospital recovering from surgery for colon cancer. The previous 8 months’ symptoms unnoticed … Thankfully a trip home ( two flights) over winter break caused the tumor to bleed and presented symptoms of severe anemia. I was hospitalized almost immediately, diagnosed with cancer two days later & operated on within 3 days. PLEASE share with others what you find beneficial and share insights of your journey, here also.